When ordering please indicate what size in the short or long. See notes below for breed use. Short Style $30 each, for general all-around use. Blade width approximately 1-1/2", overall length with handle 7-1/2". Long Style $40 each, for faster body work and larger breeds. Blade width approximately 2-3/4", Overall length with handle 7-1/2". Coat-Kings work well with all different kinds of breeds and coats. 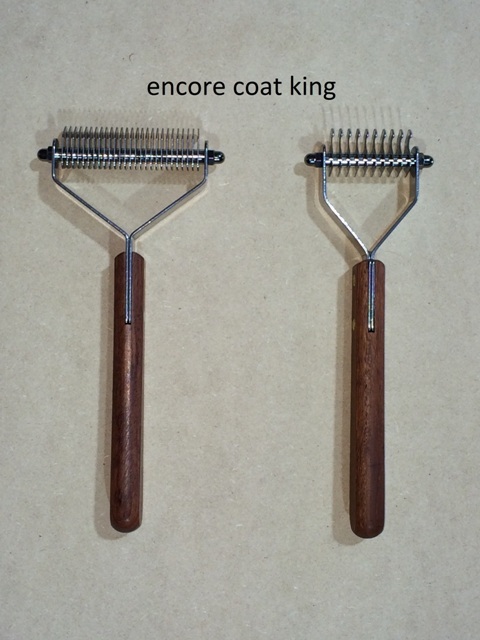 Use coarse styles to comb out the undercoat - fine styles for finishing.